A quiz that ends with things only God could know about us shows kids how much God cares about them—enough for Christ to die for them. 1. Every year Linus waits for what to appear in the pumpkin patch? 2. What do pumpkins grow on? 3. What were the first Jack-o-lanterns made from? 4. In what country did trick-or-treating begin? 5. Original candy corn comes in which three colors? 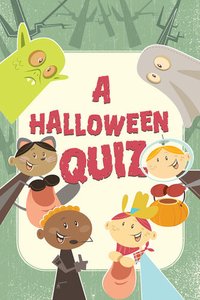 How did you do on the Halloween quiz? Now that you're warmed up, let's move on to a couple of harder questions. Ready? Give up? Most heads have about 100,000 hairs! But who could know exactly how many are on yours? "Wait a minute!" you're thinking. "Nobody knows that answer!" Well, astronomers estimate there are from 200 to 400 billion stars just in our galaxy, the Milky Way. Who knows the exact answers to those first two questions—and everything else there is to know? God does. His special book, the Bible, says that he created the universe and everything in it. The Bible says, "He determines the number of the stars; he gives to all of them their names" (Psalm 147:4). And when it comes to the smallest details, the Bible says that "even the hairs of your head are all numbered" (Matthew 10:30). God knows every detail about the universe—and all about you! So whether it's enormous or tiny, God knows all about it. God Not Only Knows—He Cares How can we know that someone so powerful and intelligent would care about people on a little planet like ours? Two thousand years ago God sent his only Son, Jesus, to be born and live on earth and then to die for us—that's how we know! Wait a minute. What could possibly be so bad that God's Son would have to die for us in order to make things right? It's what God calls "sin." Sins are the bad things you do and say that get you into trouble at school and at home. Sins are also the thoughts that lead you to disobey and tell lies. The Bible says that "all have sinned" (Romans 3:23)—kids and adults. Sinning is doing the opposite of what God wants us to do. That's why sins have serious consequences. If nothing is done about them, we can't please God with our lives now, and we won't go to live with God forever after our life on earth. So God did something about our hopeless situation. Jesus became a man and lived on earth. But he was different from anyone else who has ever lived, because he never sinned. As God and perfect man, he was the only one qualified to die in the place of every sinful person. "For there is one God, and there is one mediator between God and men, the man Christ Jesus, who gave himself as a ransom [payment] for all" (1 Timothy 2:5�6). When he died on a cross he took the punishment we all deserve. "God shows his love for us in that while we were still sinners, Christ died for us" (Romans 5:8). It was the only way to save us from being separated forever from God. "God so loved the world, that he gave his only Son [to die for us], that whoever believes in him should not perish but have eternal life" (John 3:16). When Jesus came back to life three days later, it proved that God had accepted his payment for us! You can have eternal life and be forgiven by believing that Jesus died for you. Do You Know the God Who Knows Everything? Dear God, thank you for loving me so much that you sent Jesus to die in my place. I'm sorry for the sinful things I've done. Now I truly believe that Jesus died so I can be forgiven and live with you forever. Amen.